As beach season draws frighteningly close, hubby and I are watching what we eat like hawks. My student sister is providing some inspiration with her GM diet, aimed to knock off the pounds before big nights out. 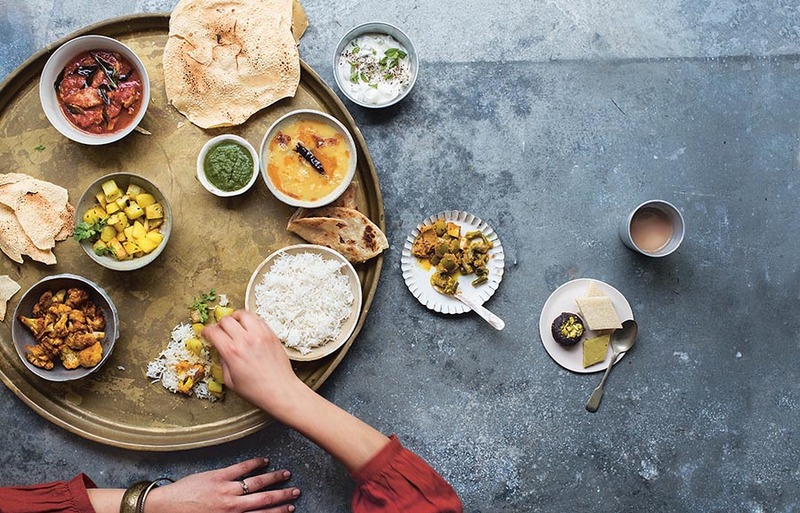 Indian food has a bad name for greasy fatty feasts, but summer in an Indian kitchen features many cooling, lightly-cooked meals. The BBQ becomes our very own tandoor as the weather turns, with sizzling tandoori chicken, nilgiri kebabs and shashliks. Curries are cooked with a light gravy and yogurt features in many guises. 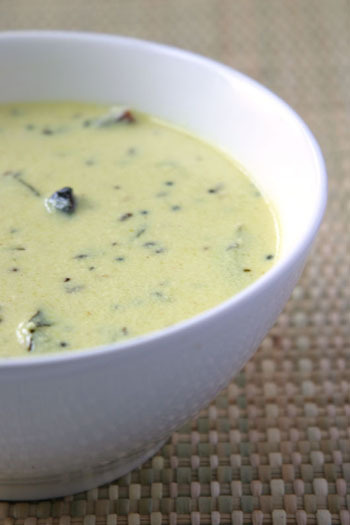 One hugely popular yogurt dish is kadhi, a Gujarati specialty, that can best be described as a soup with tempered spices. 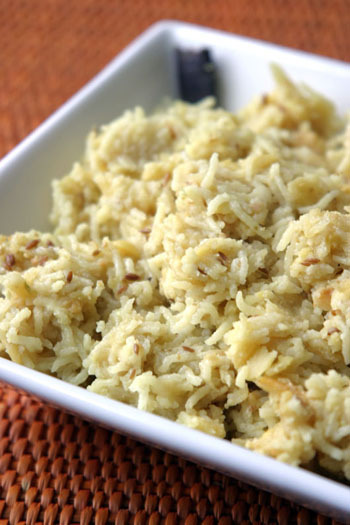 It is very easy to stomach and is best served with khichdi. In anticipation of the hot months lying ahead, I requested Coffee for the recipe for kadhi. Both Trupti and hers, combined with some experimenting, gave me the perfect result I enjoyed in India as a child. I ate it with Coffee’s nutty khichdi, which was absolutely delicious too. In a large bowl, mix together the yoghurt, water, gram flour, salt and sugar. Whisk it briskly until bubbles appear. This will prevent it from splitting later. In a small pan, heat the ghee and when hot add the asafoetida. When it dissolves, add the mustard seeds and the jeera. As they start sizzling, add the curry leaves, turmeric, ginger and chillies. The curry leaves change colour to a darker green and when they do, take the tempering off the heat and mix it well into the yogurt. You can leave this mixture until you are ready to eat. Then heat the yogurt through gently on a low simmer until the raw taste of the gram flour disappears. Be sure to keep stirring so that the curd does not split. The consistency should be light and runny and the kadhi should be sweet, sour and delicious! Pound the chopped garlic, ginger, chillies and peanuts coarsely. I blitzed them in a blender but you could use a pestle and mortar or simply a plastic bag and rolling pin. Heat the oil and fry the whole spices (cumin, cloves and cinnamon) until sizzling and then the peanut mixture for five minutes. Add the rice and the lentils, turmeric and garam masala and coat it well in the masalas. Add the hot water, bring to boil and then simmer, covered, until the rice and lentils are cooked. Alternatively, you could pressure cook the whole thing (10 minutes after the first whistle). Thank you, thank you thank you for this blog. I am married to a British Man who introduced me to the joys and wonders of indian food… I was delighted more than you can possibly imagine to find your blog. please keep them coming, there’s a need out here more than you know. bookmarked. I’ll be back! i tried the kadhi & it was a delight! i haven’t cooked in the longest time & believe me when i say i have to be really motivated to get into the kitchen. i love kadhi & got this crazy urge to have it. that was my motivation…..it was so easy!!! i loved it! you do live up to the name “quick indian cooking”! This website is my saviour! i have recently married a Gujarati Hindu, and I am trying so hard to cook like his family used to for him, but with no one to teach me, this website has allowed me to cook most of his favourite dishes. thanks so much! Does anyone have the recipe for making debras? Rotli like bread made from spinach etc. My guju boyfriend likes it alot and me being punjabi do not know how to make it for him. Serving it nicely with a hot papad and simple veg salads wud be yummy.